I recently attended the emotional graduation ceremony at Kitchens For Good, a place where individuals once convicted and hopeless are given a second chance. 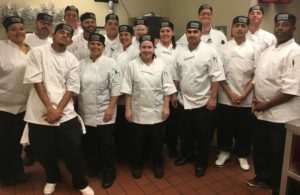 This non-profit organization has an ambitious multi-tiered mission of breaking the cycle of food waste, poverty, and hunger, while training people previously incarcerated and often considered unemployable to flourish in the culinary arts. The program also accepts youth aging out of foster care, victims of domestic abuse, and homeless individuals fighting addiction or mental health issues.